WarioWare: Snapped!, known as Utsusu Made in Wario (うつすメイド イン ワリオ Utsusu Meido in Wario) in Japan, is a DSiWare game for the Nintendo DSi, and is part of the WarioWare series of games. It was revealed at a financial briefing by Nintendo on October 31, 2008. WarioWare: Snapped! was released as a launch title for the price of 500 Nintendo Points. "Utsusu" is Japanese for "being shown in a picture or video", which refers to the game's main feature of using the Nintendo DSi's built-in digital camera to make a silhouette of the player to use as a character in the microgames. WarioWare: Snapped! and the past release, WarioWare, Inc.: Mega Party Game$!, are the only WarioWare games that don't have plots and story-themed stages. Wario opens his own amusement park called Wario Park, which has four roller coasters. Mona, Jimmy T., Kat and Ana become the park's employees and run it along with Wario, with each character running one coaster. Aside from the opening which shows the Wario Park scenes, WarioWare: Snapped! has no storyline. The player, portrayed by his or her silhouette as seen by the camera, has to grab the coins in one of Wario's microgames. As with previous WarioWare installments, WarioWare: Snapped! uses a special control scheme. The Nintendo DSi's built-in camera is used to create a silhouette of the player in the microgames. During the game, the Nintendo DSi is placed on a flat surface. To ensure that the player is at an ideal distance from the DSi, the player has to put his or her head and hand to match the respective outlines on the screen. In the microgames, the player must perform certain movements to win the games, such as grabbing coins with the hands, opening the mouth to eat food or catching an object with the head. At the end of a stage, photos of the player that were made during the won microgames are put into a humorous slide show. In comparison to its predecessors, WarioWare: Snapped! has a much smaller amount of content. Only twenty different microgames are available which all allow for a considerable amount of time. There are neither different difficulty levels nor increasing speed. The game features four different stages which are hosted by Wario, Mona, Jimmy T. and Kat and Ana, respectively. Each stage includes five microgames that appear in random order. While fifteen of the microgames are designed for one player, two players have to act in Kat and Ana's stage. There is no direct penalty for losing a microgame, but it will result into a missing part of the five-part slide show at the end of a stage in each case. There are four different slide shows unique to the character. Wario animates the player's actions, Mona and Kat and Ana add stylish decorations to the player and Jimmy T. puts the photos into a comic strip. However, the slide shows cannot be saved. Additionally, the game's staff credits appear as a mini-game where the player has to steer a line of roller coaster cars through the space. They must collect the occupation terms and the letters of the staff members to score points. The high score of the mini-game cannot be saved, either. The Wario Coaster microgames require big moves. After this level is beaten, the player can see himself or herself doing the actions required to win the microgames in a slideshow. 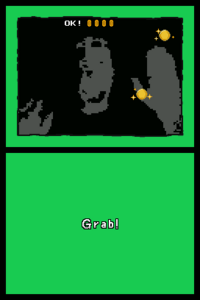 A microgame involving the player using their hands to grab five coins that appear on-screen. A microgame where the player must have his or her hands on three numbered balls at the same time, three times. A minigame involving the player getting their head closer to the screen to look inside a hole. A microgame where the player shakes their head to dry a dog. A microgame involving the player tilting his or her head to pour water on persons' heads. In Mona Coaster microgames, the player must align his or her body with stuff that appears on-screen. After the level is beaten, a slideshow shows the player using decorations, based on the microgames actions. A microgame where the player must move his or her head to wear one of the falling hats. A microgame involving the player making biting movements with their mouth to eat a loaf. A microgame where the player must move his or her head in order to fit two eyes into glasses. A microgame where the player must get kissed by two characters who shortly appear on the screen. A microgame where the player must use their hands to kill one or two flies. In this stage, the player must do varied actions. At the end, snapshots of the player are used to create a comic strip. A microgame involving the player massaging the shoulders of an elderly woman. A microgame where the player should wave goodbye to a girl. A microgame where players must have their finger either through a floating ring or picking a floating nose. A microgame where the player must play peek-a-boo, so the baby stops crying. A microgame involving the player blowing into the microphone to blow away a man's scarf. In this stage, two players are required to play. A microgame where the players must simply get cheek to cheek to win. A microgame involving the players positioning their heads on totems. A microgame where the players must shake their hands and heads to wipe the screen and reveal an item. A microgame involving the players smashing a stone with their heads. A microgame where one player controls a sweaty sun that must get out of the clouds, so the other player's fan cools it off. Nintendo DS Craig Harris, IGN 7.8/10 "Wario Ware Snapped is a great tech demo that doesn't quite reach the obvious potential. The camera minigames are a lot of fun and that fun is enhanced with the payoff of the snapshots that have been taken during gameplay. It's a huge letdown that you can't save these snapshots, however, and hopefully Nintendo will let the team finish what they started so that gamers can send their wacky photo sessions to their friends." Nintendo DS Jim Rossignol, Eurogamer 5/10 "Given the limitations of how and when the game will work, along with the lack of content, it's hard to bang the rubber stamp of approval on Warioware Snapped - but it's fun for as long as it lasts.'" Nintendo DS Randolph Ramsay, GameSpot 4/10 "WarioWare: Snapped has plenty of the undeniable charm and goofiness the series is known for. But it simply doesn't last long enough for its asking price, and apart from making your friends play it for cheap laughs, there's no replayability here. You can get much better value from your 500 Nintendo points than spending them on Snapped." Nintendo DS Marcel van Duyn, Nintendo Life 4/10 "All previous WarioWare games are pretty "short" – you can plough through the main story in under an hour – but there is a ton of replay value in setting new high-scores and playing unlockable "full" games. WarioWare Snapped!, however, lets the series down; it feels more like a tech demo than anything else – there's no replay value because high-scores and full games have been removed, and then you have to be content with the fact that there are only 20 microgames to play (instead of the hundreds available in every other WarioWare!). Unless you really enjoy seeing replays of yourself looking like a fool, we recommend you avoid purchasing this game. Buy any of the previous WarioWare titles instead." For this subject's image gallery, see Gallery:WarioWare: Snapped!. This page was last edited on March 22, 2019, at 22:17.